Thousands took part in the celebrations. The president and the prime minister issue messages of peace and prosperity. Former King Gyanendra joined in the festivity. 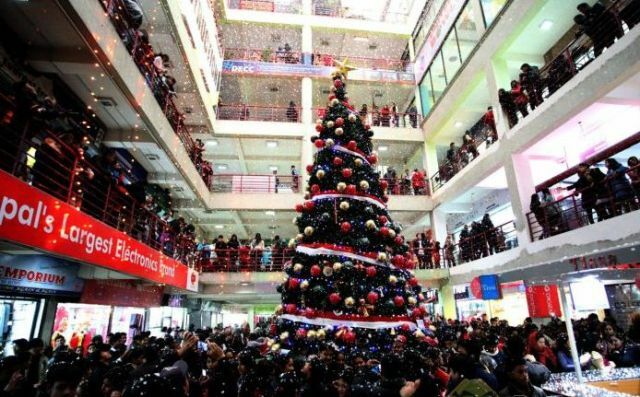 Kathmandu (AsiaNews) – The Government of Nepal reinstated Christmas as a national holiday under pressure from minority groups. Back in April, it had dropped the festivity from the list of statutory holidays. Shops and malls were decorated with Christmas decorations, lights, and trees. Christians sang hymns, exchanged gifts, glorified the birth of Jesus Christ, and said prayers. Thousands of non-Christians took part in the festivities and celebrations as well. Nepali President Bidya Devi Bhandari led public celebrations. In her address to Christian leaders, she said that she hoped that this occasion "would reinforce feelings of love and unity among Nepali citizens and inspire everyone to respect the Constitution in the name of a peaceful and prosperous Nepal." Prime Minister Pushpa Kamal Dahal expressed wishes of "peace, happiness, prosperity, good health, unity, and brotherhood to all Nepali Christians at home and abroad". Even former Nepali King Gyanendra Shah and his son joined in the celebrations. This however was met with sarcasm from some Hindu believers and spiritual leaders (babas) who, according to local media, still aspire to see Hinduism restored as the state religion.